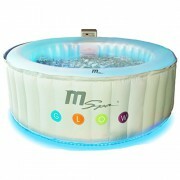 The Bestway Lay-Z-Spa Paris is one of the most beautiful hot tubs we have ever reviewed, with a an impressive LED lighting system that really adds a lot of style to your soak. Plus, with a host of modern features, such as an AirJet massage system and rapid heating, you’ll be amazed by the sheer therapeutic power of this punchy inflatable hot tub. 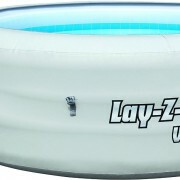 Perfect for a range of social functions, as well as daily family use, the Lay-Z-Spa is a contender for the best inflatable tub available on the market today. 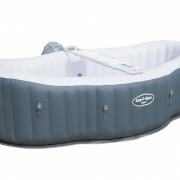 The Lay-Z-Spa Paris is one of the larger inflatable tubs on offer from this manufacturer at just under 2 metres in width (196cm), providing room for four or five fully grown adults to comfortably relax without the need to squeeze in tight. 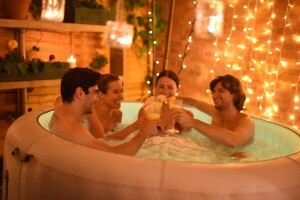 A common complaint amongst inflatable hot tub owners is that the manufacturers tend to exaggerate how many people they can comfortably hold at one time, often allowing for no wriggle room between each person, which is definitely not a relaxing way to sit. The manufacturer has stated that this tub will hold six adults, but we believe this to be the maximum capacity, rather than a comfortable amount of people to have in it at one time. However for most families, who usually have a smaller child or two that don’t take up too much room, six persons soaking in this tub at one time shouldn’t be a problem. This tub is slightly taller than the previous model in the range, the Vegas, at a height of 66cm compared to 61cm. However, they are both the exact same width of 196cm, so it is really only a very small advantage in terms of size. One of the main differences between this new model, compared to the older variants in the range, is the amazing multicoloured LED lighting system that will illuminate your cosy tub at night, bringing a little glamour to your back garden. Now don’t go thinking that this is a tacky gimmick that has been thrown on at the last minute because the lights are very tastefully incorporated into the tub, creating a soothing glow around the edge, providing an amazing sensory experience. You can change between seven different colours, using a handy wireless and waterproof remote, or simply let it cycle through all of them automatically as you soak. This lighting system is such an advantage for parties and other social events where your inflatable hot tub can act as a the main focal point. Plus, if you’ve got children, they will love playing around with the lights even more than you will! The massaging power of the Lay-Z-Spa Paris is huge, with a total of 87 air jets that have been placed all around the circumference of the tub, to create an all-round soothing experience, wherever you may be sitting. With such a large amount of jets on offer, you won’t have to worry about finding that secret spot in order to get the best experience because even with the tub full of people, everyone will feel the benefit. This hot tub has a rapid heating system that will warm up the water to the desired 40 degree temperature much quicker than conventional tubs, meaning that you will spend less time getting it ready for guests and family members. Plus, it even has a built in timer, which will allow you to set the exact time that you wish it to start heating up, instead of having to do it yourself manually. Just imagine arriving home after a long day and getting straight into that steamy water, without having to wait around at all. This tub takes around 10 hours to heat up fully, at a rate of approximately 2 degrees per hour, so you may want to set the timer to start in the middle of the night, ready to be used for a morning soak. Included with this tub is a really useful insulating lid, which will not only stop unwanted garden debris falling into the water, it will also help with heat loss and therefore reduce the amount of electricity consumed. One of the main benefits of an inflatable hot tub is how quick and easy it is to setup, requiring no previous experience or technical know-how. 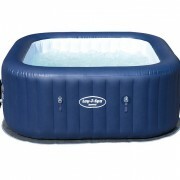 The Lay-Z-Spa Paris is no different, taking only minutes to inflate and around 15 minutes to fill fully with water. All you need is an area big enough to accommodate the width, that is also completely flat and level, with some wriggle room to allow everyone to get in and out easily. 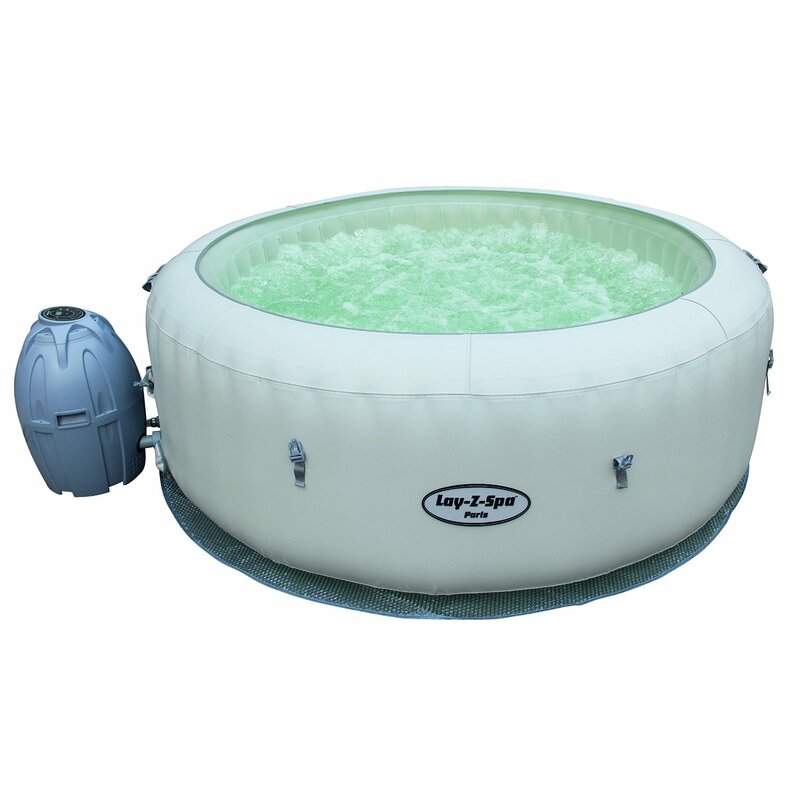 Remember, with inflatable hot tubs there is no plumbing required and you only need to plug it into a standard wall socket, so you can place it anywhere you want in your garden, as long as you have a long extension lead at hand. Included in the box is a easy-to-follow setup DVD, which contains everything you need to know to get this tub up and running. The videos are very clear and simple, making it an effortless job for someone with absolutely no experience doing this kind of thing, or tools of any kind. The sturdy leatheroid cover has two double lock safety clips attached, providing assurance that family pets, wild animals or young children won’t be able to climb into the tub and possible get into trouble. 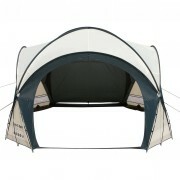 The Lay-Z-Spa Paris is made of a very strong and fully puncture resistant Tritech 3-ply material, that features a reinforced polyester mesh core inside two layers of PVC. All you really need to know is that the material is incredibly strong, able to take lots of wear and tear without springing any leaks. Also included is an air pad cushioned floor, which sits underneath the tub and acts as a barrier between the material and the hard, often jagged ground. As well as protecting the tub from damage, it also acts as a great insulator. 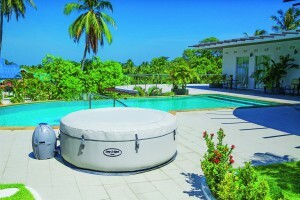 The Lay-Z-Spa Paris is an inflatable hot tub that is simply perfect for large families, or those wishing to entertain their friends in style and comfort. Not only will you benefit from everyday therapeutic soaks, you’ll also wow your guests with a stylish, entertaining and relaxing sensory experience that they will never forget. With strong build quality, excellent safety features and incredible ease of use, you’ll be using this tub for years to come.